Are you looking for your dream home but nothing is quit right? Are you wanting to sell but your home but it first needs a little TLC? Or are you wanting to make an investment and get the biggest bang for you buck? We have the right partners, skills and knowledge to help you meet your remodel goals. No matter what your situation, we are here to help. Give us a call to discuss your home buying, selling, or investing goals today. 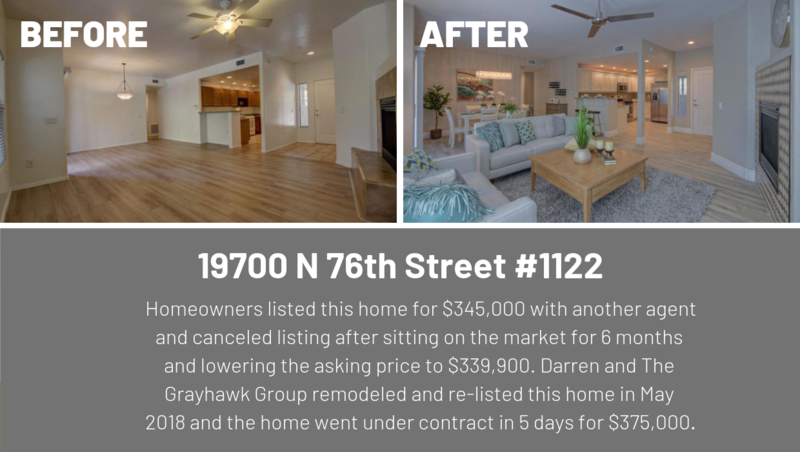 Watch these 2 short videos to see the Grayhawk condo Blank Canvas before and the after Results! Thank You Jeanine Mateo for your Interior Design expertise on the remodels listed here. 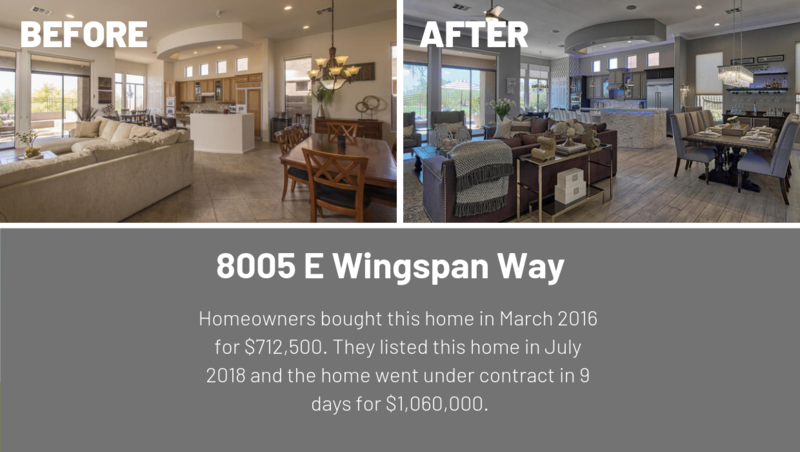 You can reach Jeanine at 602.690.5771 or jeaninemateo23@gmail.com. Replacing your front door and garage door delivers 85-100% ROI due to their high functionality plus curb appeal. Siding replacements and wood deck additions deliver 70-80% ROI. A minor kitchen remodel will deliver 70-80% ROI, whereas a major kitchen remodel will deliver about 65% ROI. Window replacement will deliver 68-78% ROI. Roof replacement will deliver 60-70% ROI. Bathroom remodel will deliver 60-70% ROI. How Will I Pay For My Remodel? Using a Home Equity Line of Credit (HELOC), which is a second mortgage you can put on your home. It functions like a credit card in that you can draw on it (using a checkbook or credit card) when you need it. You can put a HELOC in place and leave it at a zero balance until you need it, and you’ll only ever have a monthly payment on the account if you use it. A lender can tell you more about obtaining and using a HELOC. The Results Are In The Sales!